By-pass is that protein which by-passes Rumen without degradation and is digested further in the digestive tract. This protein enhances milk production. The level of By-pass protein is high in some feed ingredients such as cotton seed cake, and soya meal but is less in other protein sources such as mustard cake. Milk producing animals have 4 chambers in their stomach for digestion. The first chamber has a storage capacity of 50 to 60 Litre, where straw & fodder get fermented, This chamber is called rumen. 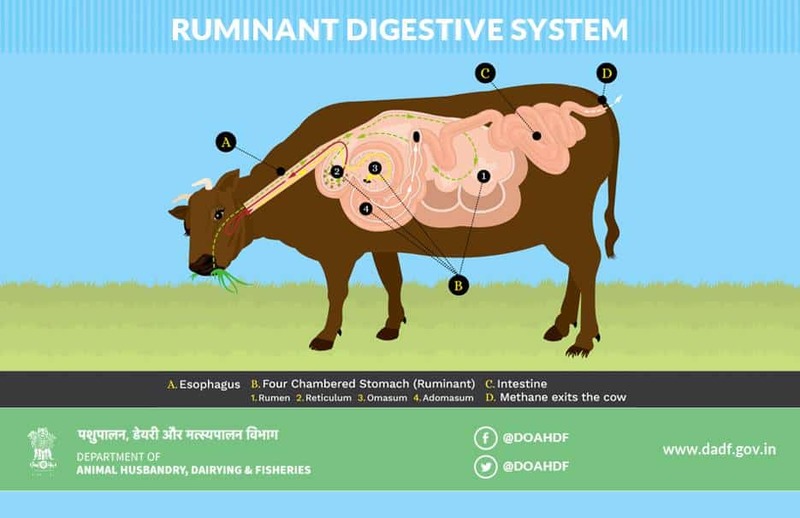 There is an immense amount of bacteria in rumen, these bacteria help in digesting straw & fodder, but when we give the animal a protein meal, bacteria turns 60% to 70% of protein into ammonia & this ammonia turns into urea in the liver, which excretes of the body through urine. So, the whole protein meal which is essential for the animal is wasted. But if we give appropriate chemical treatment to the protein meal, then the bacteria present in the rumen can’t break the meal & it will be well absorbed and digested in the lower part of the stomach. This method of processing protein meal is called BYPASS PROTEIN TECHNIQUE. The bypass protein supplement provides amino acid which is absorbed by the small intestine, this increases the milk production of milch animals. Protein is usually the first limiting nutrient for cattle and buffeloes fed low quality forages. All ruminants derive their protein requirement from two sources. One is rumen un-degraded feed protein that gets enzymatically digested in the abomasums and small intestine and another source of protein is rumen microbes. The microbial fermentation of soluble protein in the rumen is an unavoidable consequence of digestion and under many circumstances; it is a wasteful process because high quality proteins are broken down to ammonia, excess converted to urea in the liver and excreted through urine. The solubility of proteins change when subjected to special chemical treatment, advantage of which is to protect good quality proteins from rumen degradation. Number of chemicals like acetaldehyde, formaldehyde, glutaraldehyde, ethanol, tannic acid, acetic acid, sodium hydroxide etc. have been tried to protect proteins. Amongst all, aldehyde suggested for protection of protein, formaldehyde has been extensively used for production of bypass protein feed. 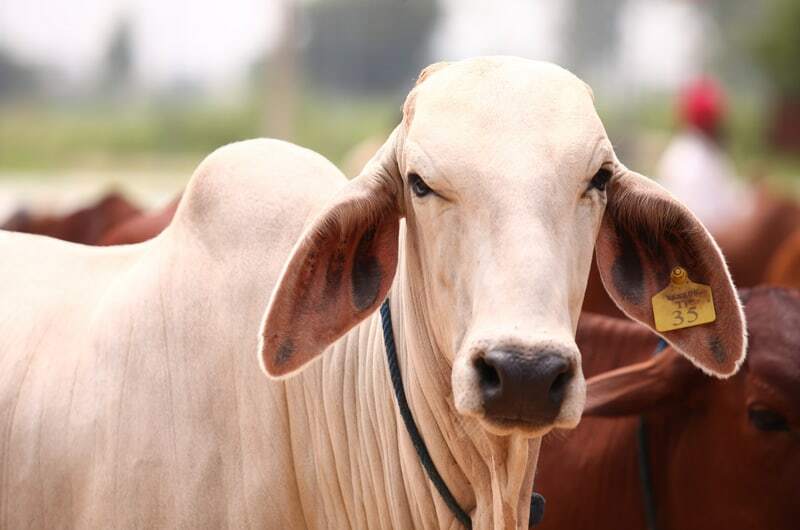 Usually, protein meals are fed to ruminants in India, which have variable degree of naturally rumen protected proteins. Protein meals, particularly rumen escape proteins, play a very important role as excellent protein supplement, in livestock feeding. When these meals are fed as such to ruminants, about 70 per cent of the protein is broken down to ammonia by the rumen microbes in the rumen and a significant portion is converted to urea in liver and excreted in the form of urea through urine. However, if these protein meals are subjected to suitable chemical treatment, then their efficiency of utilization can be significantly improved. When chemically treated protein meals replace untreated one, then due to less degradability of the protein in the rumen, excessive loss of both nitrogen and energy could be avoided, resulting in an increased energy and nitrogen balance, leading to increase in milk yield and milk constituents. Bypass protein feed is a new generation cattle feed in India and is manufactured by a special chemical treatment, developed by the National Dairy Development Board (NDDB). Bypass protein feed contains a large percentage of solvent extracted protein meals in treated form, grain by-products, whole grains, molasses, minerals and vitamins. The special feature of the formulation is that more than 70 per cent of the total protein in the feed is rumen undegradable protein. • High level of crude protein. • Optimal essential amino acids profile. • About 70-75 per cent of the protein to be in a rumen un-degradable form (UDP). • Approximately 80 percent of the rumen un-degradable protein to be digestible in the small intestine. Usually, rumen degradability of crude protein from protein meals is in the range of 50-75 per cent. As a result, net availability of amino acids for milk production is low. If these protein meals are given suitable chemical treatment to reduce rumen degradability of protein to 25-30 per cent, net availability of amino acids could be increased for milk synthesis. The amount of formaldehyde required to optimally protect protein in different protein meals, without decreasing the digestibility of protein and essential amino acids is very important. If excess formaldehyde is used to protect protein, then the complexes formed between formaldehyde and amino group of protein are acid resistant (Ashes et al. 1984) leading to reduce protein digestibility and bio-availability of essential amino acids at intestinal level. In effect, the protein will be “over protected” from ruminal degradation and metabolism. • Increase in efficiency of utilization of proteins. • Increase in availability of essential amino acids. • Increase the supply of limiting amino acids like lysine and methionine to the small intestine. • Improvement in milk production. • Improvement in fat and SNF per cent. • Better growth in young animals. • Easier to meet the requirement of high yielding animals. • Improvement in reproduction efficiency. • Better resistance against diseases. • Helps in increasing net daily income.